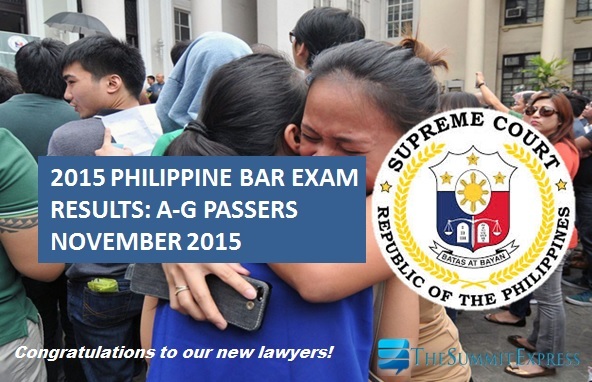 MANILA, Philippines - The Supreme Court on Tuesday, May 3, officially released the full results of the November 2015 Philippine bar exam. The complete list of passers is now available on this page. SC announced that 1,731 (26.21%) examinees hurdled the bar exam conducted on four Sundays of November 2015 at the University of Santo Tomas (UST) in Manila. Based on the revised guidelines, the 2015 bar exams have 100% essay-type questions. The bar passing percentage this year is higher than the 2014 result with only 18.82% or 1,126 out of 5,984 examinees passed the exam. Supreme Court Associate Justice Teresita Leonardo-De Castro, Bar exams committee head, said that oathtaking of the new lawyers is scheduled on June 16, 2016 (Thursday).